These are delicious, easy to make little morcels. A couple of these with a salad is a beautiful lunch, or you could serve them as finger food at a party. I use bread instead of pastry in order to keep both the cost and the calorie content of the quiches down. I also used wholemeal bread for added health-value. This recipe made 9 quiches but could so easily be scaled up. The overall time from start to finish was under 30 mins so they are really an easy lunchbox treat. Cut the crusts off the bread slices using a small bowl or large glass as a cookie cutter (search to find one that is the appropriate size). Roll the circular cut-out with a rolling pin (or I used an empty bottle of wine). Press into the bottom of a muffin tin. Repeat with another 8-9 slices of bread. Place a heaped teaspoon or so of bacon slices, and a teaspoon of onion slices, into each bread case. Bake cases + bacon and onion at ~150 degrees C for 10-15 mins or until the bread is just browning and the bacon has just begun to sizzle. In a seperate bowl, whisk the eggs until combined and add a splash (~1/4 cup) of skim milk. Season with pepper and whisk in corn and eggs. Spoon egg mixture into bread cases over the bacon and onion. Fill cases to the brim. Once full, return cases to the oven and cook at 180 degrees C for 10 mins or until quiches have puffed up. Turn oven off and allow quiches to cool in the oven. 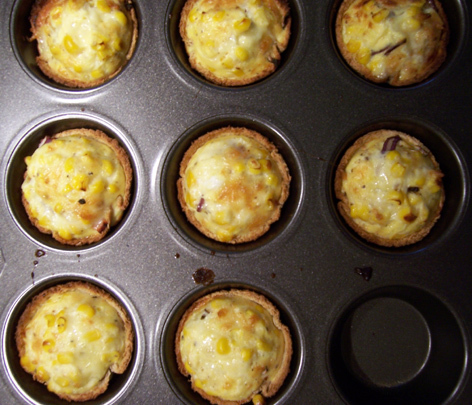 This recipe makes 10 beautiful mini quiches. Approximately calories per quiche = 100. Enjoy warm or cold.